The pair will face off against each other three times in 11 days. Tottenham play just their second ever game at their new stadium on Tuesday against City in the Champions League quarter-finals. Manchester City take on Tottenham on Tuesday in the first leg of their quarter-final tie. Pep Guardiola's side reached the FA Cup final with a 1-0 win over Brighton at Wembley. The Belgian's perfect cross set up the only goal of the FA Cup semi-final. 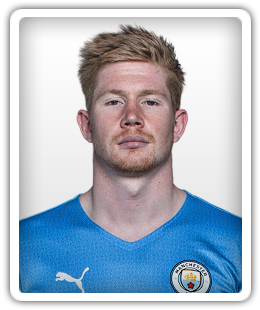 Real Madrid interested in Manchester City midfielder Kevin De Bruyne? Real Madrid are reportedly considering a big-money approach for Manchester City midfielder Kevin De Bruyne during the summer transfer window. The full-back was spotted in a nightclub in the early hours after being left out of the squad to play Fulham. The Belgium international has suffered two significant knee problems this season. The 18-year-old shone on his full Premier League debut. Relive Manchester City's comfortable 2-0 win over Cardiff City as goals from Kevin De Bruyne and Leroy Sane send the champions back to the top of the Premier League. Kevin De Bruyne, Benjamin Mendy, Fernandinho and Vincent Kompany are all available again. Sports Mole previews Saturday's Premier League clash between Fulham and Manchester City, including predictions, team news and head-to-head records. A report claims that Real Madrid will attempt to sign one of Manchester City's top players - ideally Raheem Sterling - should the Citizens land Toni Kroos.